I’m Simon Jordan, a highly experienced wedding and function pianist. I specialise in piano music for weddings and can play for your ceremony, drinks reception or wedding breakfast. You can hire me to play my own piano – or an instrument at your venue – from £175. A highly experienced and versatile musician whose CV includes solo concertos at the Royal Festival Hall, playing for the Prime Minister’s annual Christmas Party, 20 years as a producer for Radio 3 and Radio 2, and concert performances across the UK, Europe and the World. Simon’s unique experience as a musician and producer means he is a recommended supplier at a range of venues across London and the Home Counties including the Olde Bell, Danesfield House, One Canada Square, the Dorchester, Syon Park and many more. 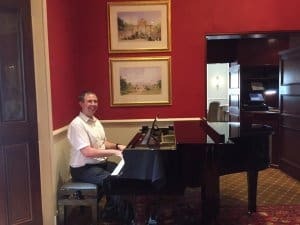 I’ve over 20 years’ experience playing for weddings and receptions and am one of the UK’s most popular wedding pianists, playing at events throughout England and Wales. Unlike every other pianist, I will play the music you choose and not make you pick from a list. A pianist at your wedding can create a relaxing and unique atmosphere, provide your favourite music in the most romantic way and then set the tone of the rest of the day. In the hands of the right pianist, this most versatile of instruments can provide an extraordinary range of different musical colour. A great pianist can provide a stunning soundtrack to your wedding ceremony. From church hymns to your favourite song, or relaxing background music, wherever you are getting married, and whatever you want to hear, the piano is the perfect instrument. While you are busy with the photographer, the best pianist can stop the atmosphere from going flat and keep your guests entertained – as well as taking requests. Now your friends and family have the chance to talk and catch-up, a friendly and versatile piano player will provide the perfect conversation starter. Your guests are in the same seats for a couple of hours – so let the entertainment begin! A well chosen wedding pianist can play everything from today’s chart-toppers to the great songs of the past and a few light classical pieces to whet the appetite. Your guests will be enthralled, and a magical atmosphere will be created. A no-obligation service in which Simon will play the music you have chosen so you can sample their sound on the piano before your wedding day. This process can take place before or after booking, over Skype or FaceTime, or in person at Simon’s studio in High Wycombe, Bucks. It is vital that you are satisfied with your music for the day, and use Simon’s versatility and experience to its fullest, so you can discuss any musical requests and requirements you have in as much detail as you like.